Intergas Rapid 25 (049917) | 3 Year Warranty* | The Intergas Rapid 25 is a 5 in 1 combi boiler, widely used by landlords & social housing due to its robust design & easy servicing. The Intergas Rapid 25 has OpenTherm technology as standard and is A-rated in both hot water & central heating mode, making it part of Intergas' efficient boiler range. Find out more about the Intergas Rapid 25 below. BOILER FLUE IS NOT INCLUDED - Please choose your flue from the 'Intergas Rapid Flues' section or the 'ACCESSORIES' tab on this page. ***PLEASE NOTE*** We will not sell this boiler at the stated price without the addition of a flue and will cancel any order not containing an Intergas Rapid Horizontal OR Vertical Flue. The Intergas Rapid 25 Combi Boiler is a very robust combi boiler and designed specifically for a long service life. Intergas Heating state 'smart in every sense' and from our view it really is... Featuring intelligent hot water preheat and OpenTherm technology as standard, means the Intergas Rapid 25 is efficient in everything it does. So what makes the Intergas Rapid 25 so good? For consumers, it's high efficiency in both hot water and central heating modes is key and the Intergas Rapid 25 retains all the benefits of Intergas’ revolutionary condensing boiler technology. Featuring 25kW of space heating and 28kW in hot water mode means the Intergas Rapid 25 will suit the majority of UK homes. 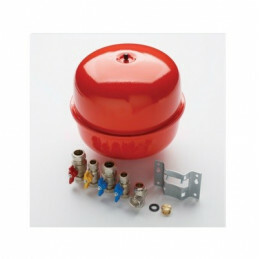 For an Installer, all the key parts in the Intergas Rapid 25 are made from copper and brass and are very easily accessible. The boiler case is removed from the front to expose the built-in 8 litre expansion vessel, so there is no struggling to test and recharge the expansion vessel each year. All the Intergas Rapid 25 parts are standard parts used throughout the Intergas range, so long term spares will be easy to obtain. Intergas provides a 3 year parts and labour warranty on the Intergas Rapid 25 as standard and this can be extended to 7 years for £150 + VAT (warranty can be extended with Intergas Heating at any point during the initial warranty period, as long as it has been serviced annually). Our own technical sales director has worked on many boilers over the years and in his opinion, none have been quite so easy to service and maintain as the Intergas Rapid 25! *An OpenTherm thermostat must be fitted to enable OpenTherm boiler control. **Built-in digital time clock can be disabled if fitted with external programmable OpenTherm thermostat. If you require any further information regarding the specification of the Intergas Rapid 25, please take a look at this link (Intergas Rapid Brochure) or please Contact Us.